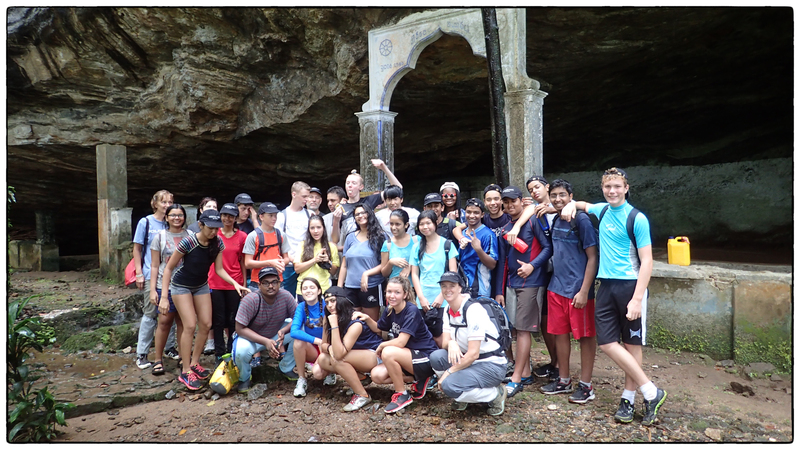 As a new student at the the Overseas School of Colombo this year, I was intrigued to hear about the IB orientation trip; it seemed to be a great way to become more familiar with both the IB DP program as well as my new classmates. The trip was a three day stay at Kitulgala, a small town in the west of Sri Lanka. 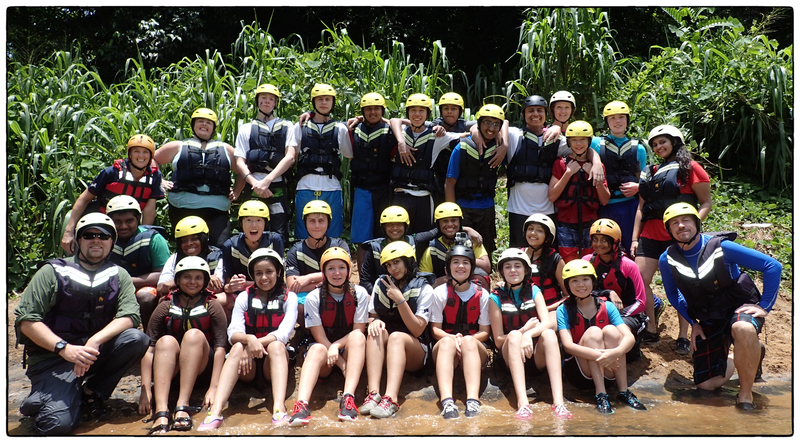 Although I had never been to Kitulgala before, I was looking forward to the trip as the exhilarating activities, such as rafting, canyoning and abseiling, that some of my friends had experienced before, made it sound like an exciting trip. My one misgiving was about the leeches – they were one experience that was in abundance at Kitulgala that I was determined to avoid. Perhaps the least thrilling part of the trip for me was the packing. Ensuring that I had the all the required material ( I made sure to include insect repellent for the leeches), and then trying to fit it all into my minuscule bag was exhausting and tiresome. However, the trip soon picked up from there as we arrived at school and set out for Kitulgala in our buses. Upon arriving at our destination, I got a first glimpse of our campsite, which was in Borderlands, the organization that had planned out our trip. The place was rustic and naturally beautiful, but I did’t get time to enjoy it just yet – we went straight into our first activity, which was rafting. Having never gone rafting before, I found even the safety briefing absorbing and interesting. During the safety briefing, we were reminded once again of the three key concepts enforced by the Borderlands team, which were safety, learning and fun, in that order. This also tied in with our own goals for the trip, as all these aspects required that we communicate and work well with our peers and challenge ourselves and keep an open mind to all the adventures ahead. 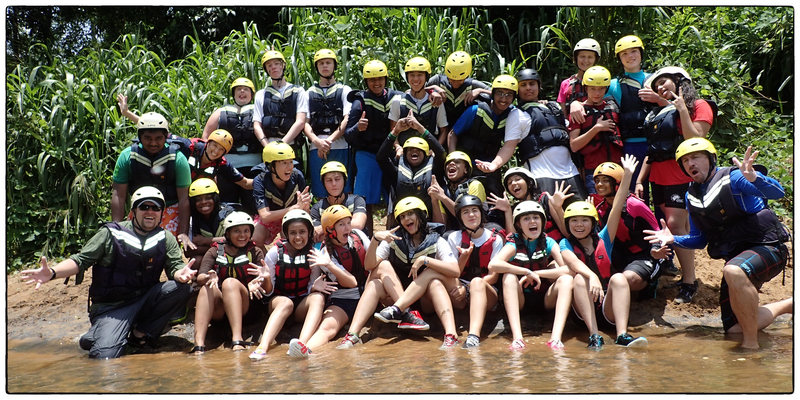 After we had properly practiced the right ways to float and row the raft, we split into groups of six and climbed into a raft with one teacher and one guide. I found it rather difficult to row in sync with my team members at first, especially as there were two different rafting techniques, but as we practiced on the calm section of the river, I quickly got the hang of it. One thing I really enjoyed about rafting was working as a team to move our raft forward or change direction – it felt great to share my success with my friends. 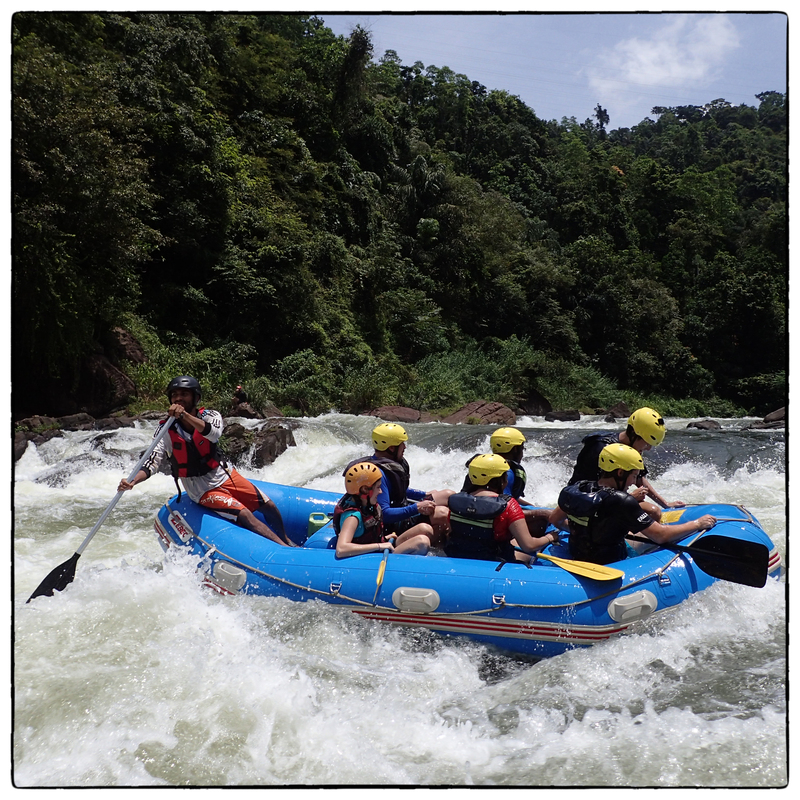 The most exhilarating part of this activity, however, is undoubtedly the part where we rowed over currents and rocks, causing our raft to toss about and spray us with water; it was exciting and reminded me of riding a rollercoaster. Lunch was a welcome reprieve after all our exertion at the river and prepared us for the second half of the evening, which was canyoning. I found canyoning to be much more challenging than rafting as the risks I took were individual and I was no longer working with a team; it was up to me to gather my courage and move forward. The first jump in the canyoning route was probably the smallest – and the most scariest. As I had never done this before, I had to trust in myself and the Borderland guides to know that I would be okay after I took that first leap. After that, sliding along the rocks and leaping off the cliffs became much easier, and a lot more enjoyable. If I had to chose, canyoning would be my favorite activity of the trip; it allowed me to challenge myself and experience new things while also having a lot of fun. The biggest challenge for me arrived the next day. 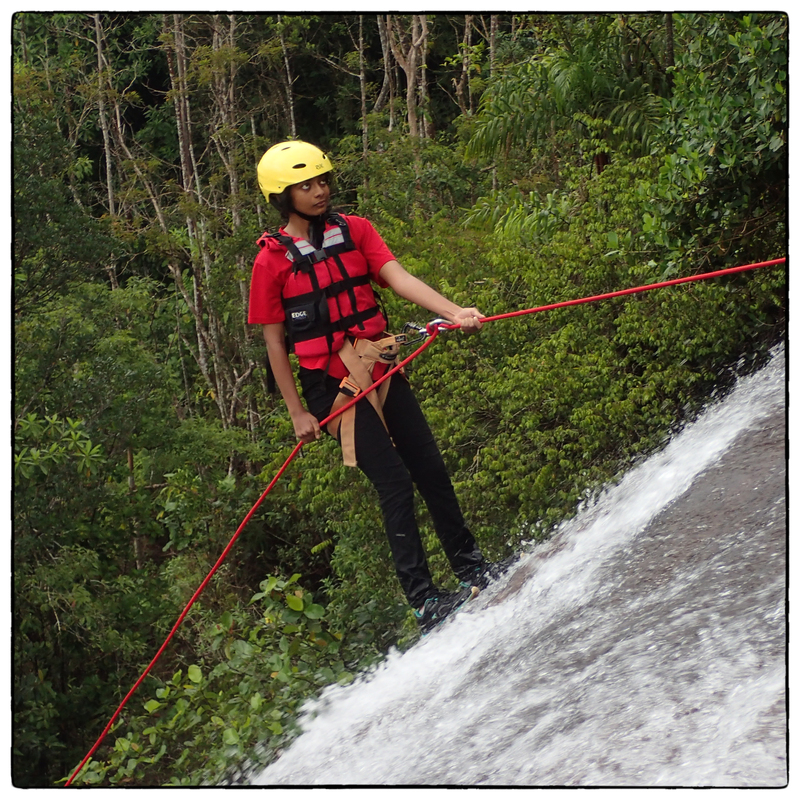 While abseiling was as new an experience for me as canyoning and rafting, it was by far the most intimidating. Watching my friends disappear down a waterfall was nerve-racking as I couldn’t really see how they were going down or how far the drop was; all aspects of the activity would be unknown until I was actually experiencing it. Surprisingly, the most difficult part of the activity was not hanging sideways off a waterfall – as I was climbing with my back to the drop, all I saw were the encouraging faces of the guides and my classmates. The challenging part for me was controlling my harness and maneuvering it correctly in order to go down slowly and stay on my feet at the same time, especially near the end of the climb when I was feeling tired and wanted to get down quickly. Although I thought I would be nervous the whole way down, I quickly grew accustomed to descending the waterfall and even managed to stay calm and get slowly up the few times I lost my footing. The several leach bites I got that day seems like a small price for the exhilaration I feel at having climbed the whole way down the waterfall. In the end, I was really grateful for the experience as it let me see how much I could accomplish if I pushed myself and believed in my peers. Before succeeding at abseiling, however, we hiked up to an ancient cave for a Theory of Knowledge session. First, we took a moment to absorb our surrounding and observe the enthralling ruins of monuments that were left in the cave. In order to appreciate the natural beauty and historical artifacts more, the care-taker of the cave gave us the fascinating back story behind the site – hearing the history of Kitulgala from a local individual who seemed to really love and be interested in the place made us appreciate it more and understand it better, making the experience unforgettable. In order to express our perceptions and views about the cave, we made small works of art using the natural resources around us. My group and I used colorful fallen leaves, water and flowers to represent the pure natural beauty of the site and created an offering in front of a small shrine as a sign of respect for the site and its religious function. Creating our art work and seeing and interpreting the other groups’ art work gave me a better understanding of the nature of art and what it means to the viewers, a topic we had been discussing in our ToK class. This session was a great precursor to abseiling as it calmed me down and made me feel ready for the more action-packed part of the day. During both those days filled with rigorous activity, I was thankful and looked forward to the evening, where we relaxed at the borderlands camp and got to spend time with each other. This was as interesting and fun for me as my activities as I got to learn more about my friends and became more comfortable around them. During these times, we also planned for the third day, where we would interact with the local community of Kitulgala in order to broaden our wonderful experiences here. On the third and final day, my group went to a local temple to speak with one of the monks about the religious and cultural aspects of Kitulgala and learn about his view of the things we had just recently experienced. As I was Sri Lankan and could speak Sinhala, I was the translator in my group – although I enjoyed communicating with the monk in our mother tongue, our whole group was delighted to learn that he could communicate very well in english, something he seemed to enjoy doing. Before posing our questions, we were given a tour of the temple and got a feel of the culture and traditions in Kitulgala. Everyone in our group had many questions for the monk, whether it be about the religion or his own experiences in Kitulgala. We learnt a lot of invaluable information in the hour or so we spent talking, such as the long, 270 year old history of the temple and the fact that many of the monks enjoyed tourists’ fascination and curiosity about their religion and loved to educate them about it. I feel like this was an essential part of our orientation trip as it allowed us to connect with such diverse individuals and provided us with a sincere link with the local inhabitants of Kitulgala as well as their abundant natural wonders. Upon returning from our orientation trip, I feel it has strengthened my confidence in myself and my ability to try and succeed at new things, helped forge new bonds with my classmates over our shared experiences, and given me a newfound appreciation of places such as Kitilgala and the inhabitants that make it such a wonderful experience. It was a memorable experience that will always remind me to keep challenging myself and be openminded about the potential of new situations.